For the AA.com online version the winners of the codes will receive an email in a couple weeks with the code. From what I can tell, you won’t know if you’re a winner until you’re notified, so go play now to improve your chances! 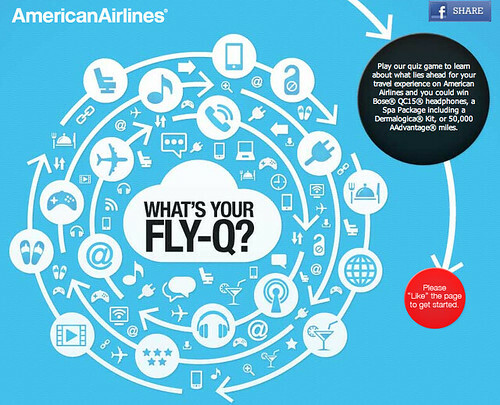 American just launched a sweepstakes to promote some of the new products and service that they’re offering and to highlight the upgrades they’re making to their aircraft fleet. 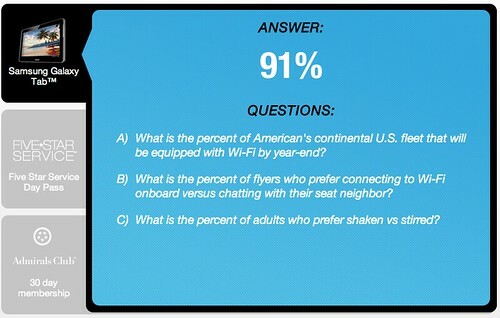 Actually, there are two sweepstakes: one is an online quiz, the other is a trivia game you play on Facebook. 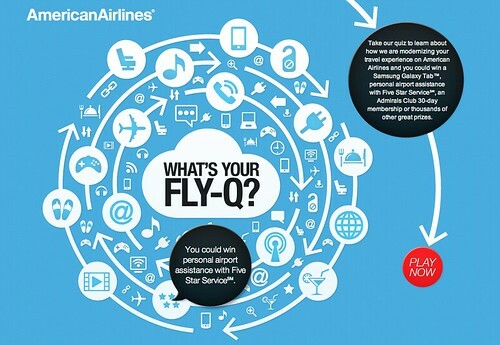 Take our quiz to learn about how we are modernizing your travel experience on American Airlines and you could win a Samsung Galaxy Tab, personal airport assistance with Five Star Service, an Admirals Club 30-day membership or thousands of other great prizes. I had a little trouble with Five Star Service, I was leaning toward guessing that it was the “finest car wash that money can buy”, but in the end I picked the right answer;-) Go here to play. The questions are pretty easy too. Here’s an example. You’ll find complete rules and terms and conditions online and the deadline to enter is 11:59 a.m. [CDT] time on August 31, 2012. Go here to play the Facebook version. 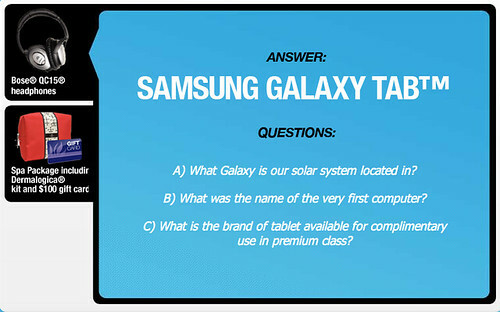 On a side note: I never understood why AA went with Samsung Galaxy Tab–and why they tout it so heavily. @ Victor – I figure Samsung must have some kind of promotional agreement. I think iPads would be much nicer (full disclosure, I’ve been accused of being an Apple fanboy). @ Jerry – I read that but didn’t get a code when I played. I saw that the contest started a few days ago, though I don’t recall seeing it, and figured I must have been too late. Anyone else play? Did you get a Gogo code? Definitely a fun little contest! @ Michael W Travels – I agree. And the person that wrote the “wrong” questions has a great sense of humor!